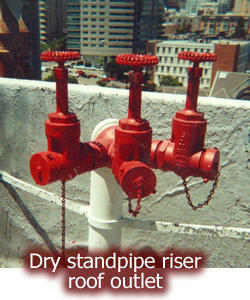 Wet/Dry Standpipe inspections, testing, certification and maintenance are comprehensive procedures. When completed, the fire safety features confirm that all system components are in good condition and will ensure the system’s successful operation. To refine fire system evaluation methods and frequency, the Office of the State Fire Marshall has made major amendments to the automatic fire extinguishing systems maintenance protocol found in Title 19, Division 1, of California Code Regulations. The amendments for fire safety and protection incorporate, by reference, the National Fire Protection Association Standard for the Inspection, Testing and Maintenance of fire protection systems, and to require the use of the newlydesigned AES 1-9 forms for the reporting of fire system evaluation results. Control Valves—to verify that the valves are in the normal open or closed position, are properly sealed, locked or supervised, provided with appropriate wrenches and identification, free from external leaks, and accessible. Pressure Regulating Devices—to ensure that the handwheel is not missing or broken, and no leaks are present. Backflow Prevention Assemblies—the double check assembly and the double check detector assembly shall be inspected to ensure that the differential-sensing valve relief port is not continuously discharging and the OS&Y isolation valves are in the normal open position, including any valves that are secured with locks or electronically supervised. Alarm Device—to be tested in accordance with the manufacturer’s specifications, and to ensure that the system’s audible alarm shall activate within 90 seconds of valve opening. Hose Nozzle and Connection—to verify that the waterway is clear of obstruction and in good condition, all controls operate as designed, and there are no missing or broken parts. Main Drain Test—to determine whether there has been a change in the condition of the water supply piping and control valves. The test is to be conducted at each system riser and, in addition to the annual test, a main drain test is to be performed any time the valve is closed at each system riser or feed main after the control valve has been closed. Control Valves—each shall be operated through its full range and returned to its normal position, post indicator valves shall be opened until spring or torsion is felt in the rod to ensure that the rod has not become detached from the valve. Post indicator and outside screw and yolk valves shall be backed a one-quarter turn from the fully open position to prevent jamming. Valve Supervisory Switches—to ensure valve is in good condition, proper movement from the valve’s normal position, and shall be properly lubricated. 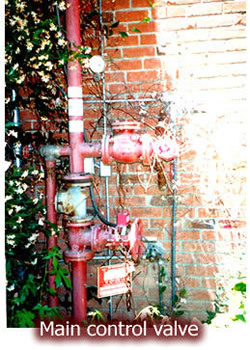 Backflow Preventer Assemblies—a forward flow test shall be conducted at the system demand, including hose stream demand, where hydrants or inside hose stations are located downstream. A backflow test shall be conducted at the completion of the forward flow test. Pressure Reducing Valve—partial flow test adequate to move the valve from its seat. Piping—to ensure there is no damage to piping, including control valves, or supervisory devices and to take corrective action if necessary. Hose Connections—to verify that the handwheel outlet is not broken or missing, the outlet hose threads are not damaged, no leaks are present, and the reducer and/or cap are not missing. Hose—for proper identification, and to ensure that the hose, couplings, and any nozzle have not been vandalized, are free of debris, exhibit no evidence of mildew, rot, or damage by chemicals, burns, cuts, or vermin. Hose Storage Device/Cabinet—to ensure that all fire hose and required components are properly stored and in usable condition. Hose—inspection of storage device to ensure that all fire hose and required components are properly stored and in usable condition. Pressure Control/Reducing Valve—full flow test results shall be compared with previous test results and any necessary adjustments shall be completed. Pneumatic and Hydrostatic Test—performed to ensure necessary psi capability. Length of hose that fails the inspection shall be removed from the service test area and repaired as necessary or condemned. Flow Test—to verify that the water supply still provides the design pressure at the required flow. Fire Department Connection—back-flushed at full flow. 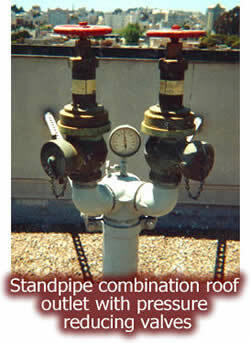 Contact A-Total Fire Protection to schedule your wet/dry standpipe fire safety services!